This week, Southeast Asia will become the centre of international political life, if not in the world, then at least in the Asia-Pacific Region. 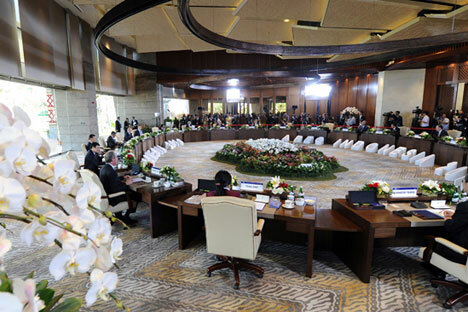 Issues of economic integration of the Pacific Basin are being discussed at the 25th APEC Summit, which is taking place in Bali at the moment. The political prospects of the region shall be the central topic at the 23rd ASEAN Summit and 8th East Asia Summit (EAS), which will be held on October 9–10 in Brunei. As to these other issues, there was no mystery – at the political level, the U.S intends bring to the foreground the issue of the disputed territories in the East China and South China Seas, thereby heating up the confrontation between some countries of East Asia and China. Actually, this tactic is nothing new. It was most fully expressed in 2010, when Secretary of State Hillary Rodham Clinton, at the ASEAN Regional Forum (ARF), declared as a national interest of Washington, the settlement of territorial disputes in the South China Sea. These actions fit into the concept of a strategic turn of the United States towards Asia, which have a clear objective – to strengthen existing bilateral strategic alliances between the U.S. and East Asian countries, as well as the consolidation and creation of new tactical alliances. Support for the political component of the external line in the economic field, follows the line of controversial initiatives – the creation of a Trans-Pacific Partnership, with Washington playing the central role. The discussion of this initiative was planned, in particular for the APEC Summit – an organization that is gradually losing its integrative influence. However, the failure of Barack Obama to make a tour of South East Asia – and in particular, to attend two key summits – during the political crisis in the United States, once again has made many countries in East Asia question whether the former role of the U.S. in containing China in the Pacific Rim will be maintained. Consequently, will the U.S. continue to support these countries in their confrontation with China – one of the main centres of this being territorial disputes involving four countries of Southeast Asia (Vietnam, Philippines, Malaysia and Brunei) and Beijing over islands in the South China Sea? Unlike the president of the United States, the Secretary of State John Kerry presents a more controversial figure trying to convince Southeast Asian countries that Washington will not abandon its allies in the Asia-Pacific Region. During Obama's first term, Kerry showed scepticism towards a strategic U-turn in U.S. foreign policy toward East Asia. “Let me clarify, none of what is happening in Washington, not in the least reduces our obligations to our partners in Asia,” Kerry already announced. However, apparently, convincing Washington’s partners in the region that the White House is ready to continue its support, in spite of domestic and foreign policy challenges in Washington, is not easy. Reluctance to provide support, despite internal political problems, has started to worry many in the region. “We are disappointed [that the U.S. president will not come],” said Titaful Sembiring, the Minister of Communications and Information of Indonesia. The cancellation of Obama's visit to Southeast Asia, according to Singapore's Prime Minister Lee Hsien Loong, “cannot be regarded as useful for the United States.” At an informal level, the representatives of other countries also expressed their concerns. These sentiments will gladly be exploited by the Chinese leadership in upcoming summits. Chinese policymakers have been gradually dropping their characteristic harsh rhetoric of previous years against many countries in East and Southeast Asia – replacing it with the “soft threats” of the resurgent Chinese economy. And then Obama provided an excellent opportunity to Beijing. That Celestial Empire will dominate the meetings this week. Chinese President Xi Jinping, during his first Southeast Asian tour, will certainly try to convince the state leaders of the need to maintain a constructive dialogue especially with China (Interestingly, the head of a key U.S. ally in Southeast Asia – the Philippines – President Benigno Aquino will not hold bilateral talks with his Chinese counterpart). The main weapon of Beijing here will simply be economic cooperation – Xi Jinping has already promised to almost triple (up to $160 billion) the volume of Sino-Malaysian trade by 2017. Together with his Indonesian counterpart, he was present at the signing of 23 Sino-Indonesian economic agreements, estimated being worth $33 billion. Further “economic carrots” from China are expected at the APEC Summit. Why did Russia snub the East Asia Summit? Foreign policy will be pursued with economic power. If not to win over Southeast Asian countries, in an attempt to at least reassure them, China will be emphasizing the central role of ASEAN in the integration processes of the Asia Pacific Region. Chances are that earlier initiatives will be brought forward – such as creating a system of collective security in the region. In this way, Beijing will strive to gradually weaken the influence of Washington. Will this be the beginning of the end of American hegemony in East Asia? Perhaps in the form, in which we see it now, yes. However, the system of international relations can expect a major shift – in the Asia-Pacific Region two other powers, which are more and more starting to assert themselves, may also take the place of the United States – these are Japan, and India. It is these two countries – which, with the blessing of Washington, now being absorbed by internal problems and paying attention to other parts of the world – could become leaders that will oppose the rising influence of China.